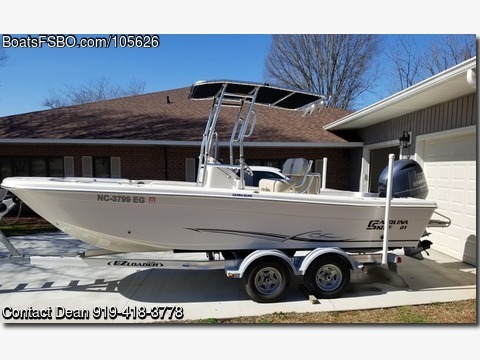 Contact the owner at 919-418-three seven seven eight...Options Included in this Package: 21 Ultra Elite In Excellent Condition Yamaha F150XB 4-Stroke Outboard w/ Electronic Fuel Injection Engine Under Yamaha Warranty Trough August 2022!! FishMaster Deluxe Folding T-Top w/ 4 Rocket Launchers HumminBrid Helix 7 Chirp Gen2 Steering Upgraded to Sea Star Hydraulic Includes Optional Raw Water Washdown Upgraded Stainless Steel Steering Wheel w/ Power Grip Knob Infinity AM/FM Stereo w/ USB, iPod input, 4 Speakers and Satellite Ready Upgraded to Console Livewell w/ LED Light Upgrade to Complete "Deluxe" Leaning Post Includes EZ Loader Tandem Axle Aluminum Trailer w/ Brakes Foldable T-top Custom stainless steel ladder Full cover boat cover Full Bow cushion, for family time Battery on/off switch Boat wired for trolling motor & has on board charger Bought new from Foothills Marine for 42 thousand without the boat cover and custom made ladder. My lost your gain basically payoff at $36,995.00 Please no low ballers Great boat, sold beach house.